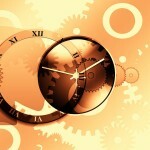 Time is one of the most mysterious subjects that we can examine because we really don’t know what time is. Of course we can measure time in ever smaller instants like days, hours, minutes, seconds and so on but because time is not constants and it can change then these measurements may vary from person to person. Before Einstein time was believed to be constant but because Einstein found out that light speed is constant then he changed the whole world upside down and showed us that actually time can be faster or slower depending how fast are we moving and how close we are to any given high mass object. Einstein showed that if you travel faster or are closer to a high mass object then your time relative to other people and things passes slower. After this discovery people started to inquire what exactly time is and even tho there is no one concrete answer the most agreed upon answer is that time is simply the forth dimension where there are 3 dimensions of space and the fourth is time. Of course this description is not 100% accurate because we can all move freely on the 3 dimensions but we are fixated in time and can’t move backwards or forwards faster. And so we are always pointed in the present moment. Time and all these strange things about it has very strong implications because if time really is the fourth dimension then there should be an option somehow how to move freely on this dimension but up till now there is no evidence that suggests that it is possible. Every person somehow understands time but no one completely knows what exactly it is and how to manipulate it. So we have a long road ahead of us!